Tied by Mike Hawkins for our second fly swap. 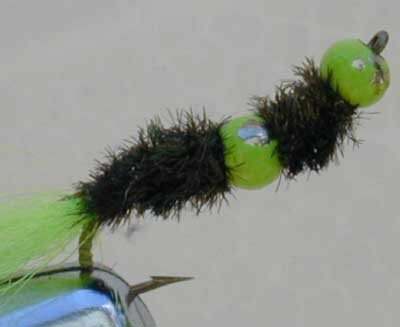 This fly works seems equally well with trout and bream. The simple design and material makes its fast and easy to tie. The key to this fly is the bend in the hook that gives it a more natural look. I vary the bead color and tail material but keep the body material the same. Thread 2 colored beads on the hook. Place hook in vice and push both beads to the eye of the hook. Tie in thread at the back of the hook and loop floss around thread and tie in tail material. Tie in 3 or 4 strands of peacock herl and wrap about half way up the hook and slide the first bead down to the herl. Tie in another 3 or 4 strands of herl and wrap to the eye and the next bead.